A decade ago the term Gran Turismo implied a fast sports-type of car, of which the prevailing Zagato-bodied superrcharged twin-overhead camshaft Alfa-Romeos were the finest example, along with the Grand Sport Bugatti from France, the Sportwagen Mercédèz Benz from Germany and our own excellent range of Super Sports models of divers famous makes. But during this year Gran Turismo has come to have a rather mare specialised but no less exciting implication. The modern Gran Turismo model is primarily a very fast motor car, having a maximum speed exceeding, or at least equalling, that, of sports/racing cars of equivalent engine swept-volume. It is, in addition, a comfortable vehicle in which to cover long distances quickly. For this reason it has a closed 2/4-seater body. It has a definite purpose for its existence, associated with competition motoring, yet it is essentially a practical, even docile, conception of the high-performance cars. As proof that such cars can be docile I would cite a 1900C Alfa-Romeo which proved capable of lapping Montlhèry Track at 114 m.p.h., after which its driver left its engine ticking over while he went away to purchase cigarettes or on some such errand, before idling back to Paris. Our Continental Correspondent summed up the modern Gran Turismo motor car when he remarked that it must have "a distinctly sports-car specification (i.e., outstanding performance for its engine capacity, implying light weight). 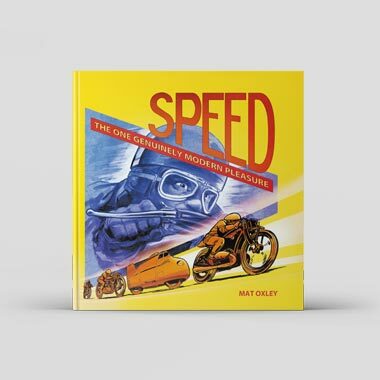 "must be handleable so that it could be thrashed over a Swiss mountain-pass or along the Mille Miglia route without fatigue or danger to its occupants," and at the same time could be used for mild or high-speed touring." When these conditions are complied with, is it any exaggeration to describe these cars as representing high performance in its most desirable form? Much as I like fresh-air sports cars, I appreciate that a closed car is apt to be faster, other factors being equal, than an open one. Moreover, for the multiple functions already outlined as required of today's Gran Turismo cars, and to resist driver-fatigue in long-distance sports-car races, such as the at Le Mans, Reims, Spa, Brescia and Mexico, a closed car has definite merits. Incidentally, that closed cars can be produced in sufficiently lightweight form to obtain the very high acceleration deemed essential in the Gran Turismo class, often from comparatively small engines, is a technical attribute in favour of these particular high-performance vehicles. So we have a sports/racing type chassis carrying a light closed body, of essentially modern outline so that low air-drag can contribute its quota to attainment of really high maximum speed. Albeit I still maintain that you cannot claim to be motoring, in the best if dated sense of the term, unless you are in all open car. These Gran Turismo class cars now tend to dominate modern sports-car races and as I write news is to hand of the Lancia Aurelia's convincing victory in the Mexican road race. 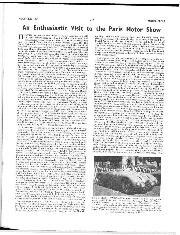 It is true that at Le Mans what seemed about to happen didn't and those exotic Alfa Romeo, Ferrari, Bristol and supercharged-Lancia Gran Turismo saloons fell out of the race for some reason or other, giving a proud British victory to the open sports/racing XK 120C Jaguar and its superb disc brakes. But everything points to the closed Gran Turismo machines having clear advantages in future sports-car races. Here perhaps we should digress for a moment to consider whether these exciting saloons which faced their drivers at the start of last year's Le Mans race were true Gran Turismo or whether they were rather specialised sports/racing cars in closed form. I do not think we need labour over this problem, Front the unhappy demise of this particular batch of cars it could be said that not one of them would have satisfied our Continental Correspondent's requirement of being thrashed over the Mille Miglia course (assuming he meant over the whole of it) and I should question whether they were quite the cars for that spot of "mild touring." But this merely serves to emphasise that Gran Turismo class cars, like the sports car, come in two versions, production and racing. 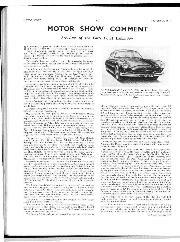 The dividing line between them is often as subtle as that which prompted David Brown to add "(S)" after the DB3 designation of one of his Aston Martin models, or, to a more obvious extent, Bill Lyons to tack a "C" onto the XK120 type-symbol of his Jaguar. So, before we attempt to review Gran Turismo please pause to consider carefully all the terms of reference you, accuse me of leaving out obvious inclusions. To enable us to keep a correct perspective I will refrain from studying the subject of when and how this category of high-performance car originated, although I am perfectly well aware that roadworthy closed fast cars are no new thing - witness the Peugeots and Chenard-Walckers which competed in the sports-car races of the mid-nineteen-twenties. The excellent Lancia Aprilia, by reason of it is shape; controllability and high speed for modest engine size in the year of its introduction might be considered a more recent forerunner of today's Gran Turismo machines. Although to woo true high performance and impeccable handleability they are essentially compact, such cars can possess reasonable seating capacity for their engine size. Thus, although only two seats may be deemed satisfactory in Gran Turismo vehicles of 2 litres capacity and under — thus letting in the Frazer-Nash Le Mans coupé and the Porsche — larger versions in many cases provide accommodation for at least three, even four, occupants, although the driver and his selected companion have by far the best of the bargain in such cases, the remaining seats being apparently intended for beings of stunted growth and a complete absence of any tendency to claustrophobia. But the point is that a sports two-seater which has grown a coupé top does not automatically count as a Gran Turismo model. Thus we find a choice of ten different makes, four hailing from Italy, four from this country, one from Germany and one from Spain. In price these distinctive carriages range front the modest £1,250 basic of the Jensen 541 (increased somewhat when almost essential extras such as overdrive, triple-carburetter high-compression cylinder head, centre-lock wire wheels (in place of bolt-on disc wheels) rev.-counter, heater and radio are included) but still ranking with the Porsche as amongst the least extravagant way of enjoying Gran Turismo, the Aston Martin, however, being not so very much more expensive) to the "ceiling prices," obtainable on application, of the Italian and Spanish representatives. Engine sizes range from 1 1/2 litres to over 4 litres and each of these cars should fairly comfortably reach at least 110 m.p.h. although the 1 1/2-litre Porsche would probably require favourable conditions in which to do this. And under such conditions the faster of these cars should reach over 120 m.p.h. Reverting for a moment to the matter of engine capacity, Porsche is the only 1 1/2-litre representative, Alfa-Romeo, Fiat and Frazer-Nash compete for 2-litre honours, and the Lancia Aurelia is what might, in this category, be termed the "classic" 2 1/2-litre size, so that it is rather odd to find Aston Martin and Ferrari coming just outside the 2,500-c.c. limit. 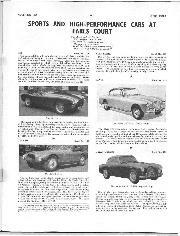 Two of the ten makes listed employ proprietary engines, Frazer-Nash (Bristol) and Jensen (Austin). Ferrari holds claim to having built cars of the kind we are considering longer and perhaps more thoroughly than anyone else. Alfa-Romeo has had almost as much technical experience of the type of engine and chassis required, and the Lancia qualifies fully for the designation of Gran Turismo. 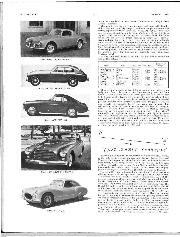 Aston Martin and Frazer-Nash lead the British contingent in years of production, with the Bristol 404 and Jensen 541 as welcome newcomers, as is the Fiat 8V and Pegaso, the last-named being nearer to pure racing-car design than any save, perhaps, Ferrari. Less was heard of the Fiat 8V this year than last, and the example entered for Le Mans by Johnnie Lurani did nothing to enhance its reputation, possibly because the car was not prepared adequately for the race, but we have no reason to consider it as discontinued. Indeed, a Ghia two-seater coupé was shown at the last Paris Salon. 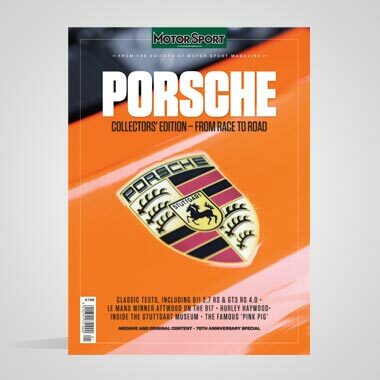 The Porsche offers a stupendous performance for a 1 1/2-litre car, which is apt to be surprising when you remember that it is developed from the bread-and-butter Volkswagen, unless you have experienced the excellence of the VW itself. But the price is sky-high in relation to the size of the little car and today, with the Gran Turismo category beginning to be quite fully represented, its chief appeal must be to those seeking a car for entry in the 1,500-c.c. class in sports-car races. Indeed, so costly are the fascinating vehicles under consideration that few, if any, of those who own them are likely to trouble about running costs, so that the greater fuel thirst of large engines is of diminished importance. For this reason the Frazer-Nash Le Mans and Fiat 8V coupés, their passenger accommodation limited to two, would seem to have little purpose apart from functions like Le Mans — although I have to confess that it is not unknown for the most expensive of Gran Turismo chassis to be sent by their purchasers to equally expensive coachbuilders for the express purpose of having two-seater coupés built on them, by Pinin, Farina, Touring, Ghia, Vignale, Saoutchik, Graber, and other artists in metal. That considerable brilliance of design and beauty of construction are found in these cars is hardly surprising in view of the performance realised, but how widely the technical approach differs is evident as each is examined individually. The 1900C Alfa-Romeo is the "hottest" example of the production models, a development of the normal 1900 and rather faster 1900TI cars. 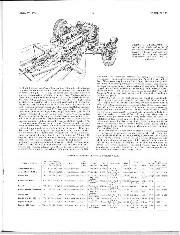 It uses a four-cylinder engine, although for many years Alfa-Romeo preferred six and eight cylinders, but the twin-overhead camshafts (chain-driven) actuating inclined o.h. valves in hemispherical combustion chambers is typical of the Milano firm. The ordinary 8 ft. 7 1/2 in. wheelbase 1900TI Alfa-Romeo will comfortably exceed 100 m.p.h. with four persons on board and give a fuel consumption of over 24 m.p.g. under normal conditions. Naturally, the 1900C, with 8 ft. 2 in. wheelbase and higher compression ratio, is a considerably faster car. The engine dimensions are almost "square," i.e., 82.5 by 88 mm., and even the bread-and-butter unit gives 80 h.h.p. at 4,800 r.p.m.. the TI, with dual downdraught Weber carburetter, poking out 93 b.h.p. at 5,400 r.p.m., and the GT a full 100 b.h.p. Suspension is by coil springs, independent, obviously, at the front and with a normal axle located by parallel radius-arms and a triangulated central linkage at the back. All-steel chassis/body construction is used. The entire machine is beautifully finished. At Earls Court the 1900C was shown as a Farina coupé. 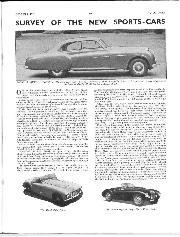 The Aston Martin DB2-4 needs little introduction. It has a six-cylinder 78 by 90-mm. engine originally conceived by W. O. Bentley for the post-war Lagonda. Twin o.h. camshafts are used above the classical shape of combustion chamber and the Vantage version is used, from which 125 b.h.p. is developed at 5,000 r.p.m., using a compression ratio of 8.16 to 1. Normally two S.U. carburetters are used, fed by dual electric pumps from a 17-gallon fuel tank. The drive passes via a Borg and Beck clutch to a David Brown four-speed synchromesh gearbox, to a hypoid back axle. The brakes are 2LS Girling hydraulic, and again suspension is by coil springs all round, with trailing-arm i.f.s. parallel radius-arm linkage at the back. The wheelbase is 8 ft. 3 in. and the chassis has been modified from the original to accommodate the two extra seats. Maximum speed is as high as 120 m.p.h. under favourable conditions, although the body is rather more bulky, not quite so finely blended, as those of its Continental rivals. The Bristol 404 was an exciting last-minute addition to the Earls Court Show. With a wheelbase of just over 8ft., a kerb weight of a shade over a ton, and the B.M.W.-base engine developed to give 125 b.h.p. at 5,500 r.p.m. with the aid of triple Solex downdraught carburetters and a compression ratio of 8.5 to 1, this car is the production version of the successful competition Type 450 Bristol and, although luxuriously appointed to enable it to line up to its title of the "Businessman's Express," it should be capable of an excellent performance in great comfort. The engine contrives to employ push-rods to actuate its o.h valves and yet to incline these valves in hemispherical combustion chambers, by making use of the cross-push-rod and rocker mechanism used before the war in the very effective 328 B.M.W. Lockheed 2LS hydraulic brakes with 12-in. Alfin light-alloy drums are used and the Bristol 401 has independent front suspension by transverse leaf spring and wishbones, and torsion-bar rear springing. Steering is by rack and pinion. Detail points of the Bristol stand out — its very complete and luxurious equipment, shrouded instruments, spare wheel and batteries accommodated in compartments in the front wings, remote gear lever and a body built in the Filton factory. The Ferrari is, in specification, closely related to the Modena factory's world-beating Grand Prix racing cars. The complicated 60-deg. V12 engine with seven-bearing crankshaft, very high-pressure lubrication, light-alloy block and head, oil-cooler and two inclined valves per cylinder operated by a single o.h. camshaft and rocker per cylinder bank drives via a five-speed gearbox with its own lubricating pumps and a propeller-shaft with steady bearing, to a normal back axle sprung on 1/2-elliptic springs and located by dual radius-rods on each side. The engine, with triple Type 36DFC Weber carburetters and a compression ratio of 8.0 to 1, develops 150 b.h.p. at 6,500 r.p.m. in 2 1/2-litre Tipo 212 Inter form. Front i.f.s. is by transverse leaf spring and double wishbones and Lockheed hydraulic brakes are used. The chassis is composed of elliptical-section tubes formed of electrically-welded Coyne steel. The fuel tank holds 24 gallons. The coupé of this sort is capable of some 130 m.p.h. Incidentally, in spite of its "racing" specification, the Ferrari engine, of which the bore is larger than the stroke, is notably reliable and docile as well. A new 3-litre version is also available. The 4.1-litre America and its competition derivative, the 4.5-litre, are, I understand, supplied in chassis form only, so are not included. The Fiat 8V has its eight cylinders in a 70-deg. vee-formation and again the bore is larger than the stroke. Light alloy is used for block and cylinder heads, with valve-seat inserts, and normal overhead valves are employed, operated by push-rods and rockers from a chain-driven camshaft in the crankcase at the apex of the "vee" formed by the cylinders. The crankshaft runs in three plain bearings and with twin Type 36 DFC3 Weber carburetters and a compression ratio of 8.5 to 1 an output of 110 b.h.p. at 6,000 r.p.m. is claimed from the 2-litre engine. The gearbox possesses four speeds and reverse, and the hypoid-bevel final and differential unit is mounted on the tubular chassis frame, universally-jointed shafts conveying the drive to the back wheels, which are sprung independently on vertical coil springs, damped hydraulically. There is coil-spring independent front suspension, hydraulic brakes with 11 7/16-in. drums, worm and roller steering and the wheelbase is the brief one of 7 ft. 10 1/2in. When shown in coupé form at Earls Court in 1952 the maximum speed was claimed to be 125 m.p.h. An interesting feature is an electromagnetically-controlled freewheel starter motor. Frazer-Nash, after very successful competition sallies with open cars, brought out a fixed-head coupé on the Le Mans 8-ft.-wheelbase chassis. The engine is the well-known Bristol unit out of the pre-war B.M.W., but it is amusing that Frazer-Nash claim more power from it than is developed by the Bristol 404 version. i.e.. up to 150 b.h.p. at 5,750 r.p.m. according to compression ratio, which can be as high as 10 to 1. The tubular chassis employs transverse leaf spring i.f.s. and the rear axle is sprung on torsion-bars and located by an A-bracket. Steering is by rack and pinion and wire wheels with knock-off hub caps are included in the basic price of £2,250. The Frazer-Nash coupé won its class at Le Mans last year. The Jensen 541 is, in my opinion, one of the nicest-looking British fast cars so far produced. It certainly caused a sensation when introduced, at a competitive price, as a surprise at the last Earls Court Motor Show. Like the Pegaso, it has won no honours in competition, has not yet been in existence long enough to have been entered for competitive events, but I think its inclusion in this discourse on Gran Turismo motor cars is justified, as with the Pegaso, on the basis of specification and potential performance. The chassis is new, differing from that of the Jensen Interceptor, being of tubular type, with a rather long wheelbase of 8 ft. 9 in. 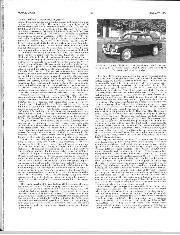 The engine is a 4-litre six-cylinder Austin Princess, with normal push-rod o.h. valve gear, having a single Zenith downdraught carburetter. It presumably develops about 130 b.h.p. but should be capable of development. Pulling an overdrive top gear of 2.68 to 1 a speed of 120 m.p.h. is claimed for the 541, with notable economy of fuel. Front suspension is by coil springs and the age-old Lancia sliding members, now inclined slightly to provide centre-point-type contact, and wishbones, with ordinary 1/2-elliptic cart-springs supporting the hypoid-bevel back axle. The hydraulic brakes have a vacuum servo, and there is cam and roller steering and stud-fixed disc wheels. Road-test reports on this beautiful coupé will confirm or deny its right to inclusion in the Gran Turismo category, but Jensen Motors are to be congratulated on producing a very Continental-looking car at an "interesting" price, and are incorporating such novel features as a flap with which the driver can blank off the radiator air intake, and the use of plastic material for the lid of the luggage locker. The Lancia Aurelia B20 Gran Turismo 2500 is perhaps the most fascinating of the cars in the category under consideration. Its narrow-vee six-cylinder engine of 78 by 85.5 mm. (2,451 cc.). with dual-choke Weber carburetter, has o.h. valves operated by a central overhead camshaft, push-rods and rockers. The valves inclined and in line with the crankshaft, so that motorcycle-type rockers are used. On a compression ratio of 8 to 1,118 b.h.p. is developed at 5,000 r.p.m., the safe maximum crankshaft speed being 5,300 r.p.m. Integral body and chassis construction is used, from which all the wheels are sprung independently, with coil springs and diverging arms, and damped hydraulically. The final drive unit is mounted on the frame structure and in unit with it is the single-plate clutch and four-speed gearbox, the latter, curiously, having a steering-column lever. The wheelbase is reasonably long – 8 ft. 8 3/4 in. – and disc wheels are again used, but with ventilatory apertures and centre-lock hubs. The brakes have inboard drums at the back, connected to the wheels via short shafts. 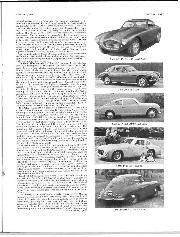 The whole conception of the Aurelia is of a very high order and the makers claim over 112 m.p.h. for the well-equipped production version, with the excellent average fuel consumption of 22 m.p.g. The weight is under 22 cwt. The Lancia Aurelia has won new fame very recently by its 1-2-3 victory in the very arduous Pan-Americana-Mexico road race, which Fangio won at an average speed of 105.2 m.p.h., although the cars used were open 3.1-litre two-seaters, not the 2.5-litre Gran Turismo model. So far, five of these magnificent cars have come to this country. One of them is the property of Leslie Hawthorn, Mike Hawthorn's father, who, when I called, was busy running it in by not exceeding 93 m.p.h. in top gear Although very fast cars, with truly remarkable cornering powers, these Lancias are outwardly unpretentious, only the low roof line and sloping rear panel suggesting phenomenal performance, while within, with the front bucket seats correctly adjusted, three persons can be comfortably accommodated, with space for two or three more in what is really intended as the luggage stowage behind the seats. In addition to this generous stowage there is a very wide shelf below the rear window and a great deal of room in the boot, wherein lives the fuel filler, covered by a flap labelled Super Carburant. The Pegaso, that exotic car from Barcelona where the (k)nuts come from, is only just becoming known, and beginning to make its debut in competitions. But I include it, on account of its very suitable specification. In Type 102B form its 90-deg. light-alloy, 80 by 70-mm., 2,816-c.c. engine develops over 170 b.h.p. at 6,300 r.p.m. on a compression ratio as modest as 7.5 to 1. This is essentially a racing-type unit, twin overhead camshafts driven by a train of gears above each bank of cylinders actuating the o.h valves, which are inclined in hemispherical combustion chambers, and the maximum safe r.p.m as high as 6,800. A single-plate clutch conveys the drive to a five-speed rear-mounted gearbox with its own oil pump, the gear changes controlled by a central lever, and the torsion-bar suspension, double wishbones at the front, on an ingenious arrangement of de Dion axle with ZF differential at the back, provides extremely good roadholding, even on wet surfaces, as I know from personal experience of the car. The brakes are Lockheed, with enormous drums, and the V8 engine can be had in various forms, even to the addition of a supercharger if desired. The, wheelbase is 7 ft. 8 in., the weight is around one ton in the more businesslike versions, and there is a very slight crab-track. The Porsche Type 356 Super is an astonishing little vehicle, using Volkswagen components. The well-tried flat-four air-cooled engine with push-rod o.h. valves is, in this instance, of 1 1/2 litres capacity, the bore being 80 mm., the stroke 74 mm. In place of the plain big-ends of the normal Porsche there are roller big-end bearings on a built-up Hirth crankshaft. The compression ratio is increased from the normal 7 to 1 to 8.2 to 1, and, with two Solex 40PBIC carburetters each feeding a pair of "pots" and sodium-cooled valves and twin exhaust systems, the power output of 70 b.h.p. at 5,000 r.p.m. is achieved. This output, and the sleek lines of the low -built 2/4-seater coupé, enables a genuine 100 m.p.h. to be attained on give-and-take roads, with a potential maximum on the autobahn of some 112 m.p.h. Moreover, for reasonable fuel consumption is a useful characteristic of these very fast Gran Turismo vehicles, 24-28 m.p.g. is obtainable according to the way the Porsche is driven. The roadholding and cornering qualities are of a very high order, special worm steering, with a divided track-rod and torsion-bar suspension with trailing links at the front and swing axles at the back, featuring in the specification. There is a delightful all-synchromesh four-speed gearbox and 2LS hydraulic brakes. Outwardly there is nothing to distinguish the coupé body from that of the ordinary Porsche, if we except the word "Super" on the badge. This car is exceptionally compact, its wheelbase measuring 6ft 11in., and is so formed that it "drives under the wind," to quote from the very beautiful catalogue issued by Dr. Ing. H. C. F. Porsche. K.G. That completes this survey of a most fascinating and covetable range of motor cars. Technically and in their manner of going they represent the pinnacle of production high performance. That their designers differ so widely in their approach to a common (if that word is permissible!) ideal is perhaps significant. We have amongst these ten marques flat-four, four-in-line, six-in-line, V6, V8 and V12 engines. There is both air and water cooling. Valves, always overhead, are nevertheless operated by push-rods and rockers, cross-push-rods and more complicated rocker gear, single overhead camshafts and rockers and by racing-fashion twin overhead camshafts. Chassis are tubular, integral with the body and spare-frame, all types of i.f.s. are found, rear axles are of normal, swing and de Dion persuasion, the suspension medium leaf springs, coil springs or torsion.bars. Some gearboxes provide four forward speeds, others five. Wheelbases vary by more than a foot. The main divergencies are shown in an accompanying table of specifications. 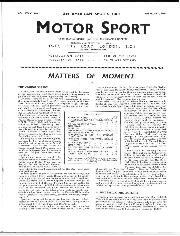 The result is, however, the same, namely, the provision of very safe, pleasant to control touring car, capable of exceedingly high average speeds under conditions such as are found in an Alpine Rally or Mille Miglia to Mexican road race, yet cars which are, withal, docile and reliable to operate. Naturally, the cost of such epicurean travel is considerable. Where possible prices are quoted, the Jensen 541 being obviously the "bargain-car" of this desirable class, although it cheats slightly by not including certain almost essential extras at the quoted price. The price of the more exclusive Continentals are pretty startling, almost prohibitive in this country. 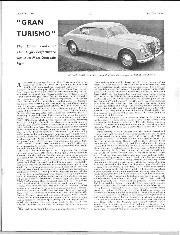 Thus I believe a Lancia Aurelia Gran Turismo costs £3,600 or thereabouts, although in Italy it is priced at rather less than £2,000. In any case, these cars are normally only procurable once a year, when those sent over for exhibition at Earls Court can be sold in this country. 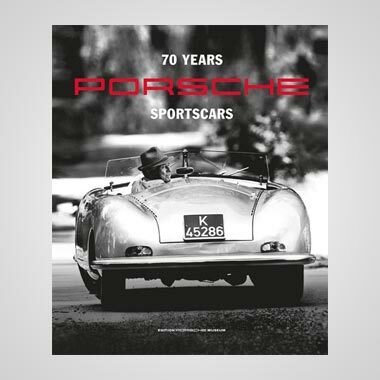 In America prices scale something like 4,200, 5,800, 8,000, 16,000 and 18,000 dollars, respectively for a Porsche Super, Aston Martin DB2-4, Frazer-Nash, Ferrari and Pegaso, and these not necessarily in Gran Turismo closed form. It is true that the motor car has become normal transportation for the masses; is no longer the plaything of the rich. Here is a class of vehicle which reverts to something of the motor car's former role, if by "plaything" can be meant a means of transport with which maps of countries are replaced by maps of entire continents and nothing is thought of flinging the machine up and down an Alp or two! Even if such motor car are beyond my reach, I find it inspiring to know that they exist; and that there are people who can drive and enthuse over them.